When I think goulash I have to think of Hungary. I have known some Hungarians in my life and they introduced me to Chicken Paprikash or Paprikás Csirke as they call it and Ćevapčići but they never cooked goulash which is Hungarian and probably the most known dish to come from Hungary and in fact the word goulash comes from the Hungarian word gulyás which is the name of a soup or stew of meat and vegetables, seasoned mainly with paprika. 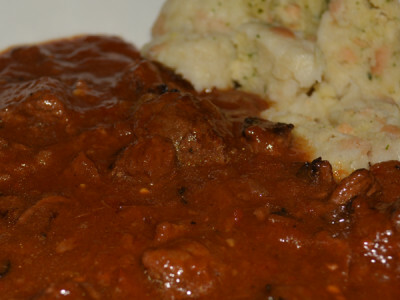 The origin of goulash traces back to around the 9th century in medievel Hungary. The meat was seasoned and cooked and then sun dried and packed into bags made from sheeps stomach, needing only water to make it into a meal. It is one of the national dishes of Hungary and a symbol of the country, but it is also a really popular dish all over Central and Southern Europe and up to Scandinavia. Now of course I don’t sun dry the meat and rehydrate it when cooking, we don’t need to do that these days. Living in Germany, goulash is an ever present on menus in the winter or if you go to an old hunters lodge, but it is rarely made with beef. They mostly use pork or a mix of pork and beef, or game would also be used, as I have had this with venison and wild boar. My German father in law actually calls any kind of stew goulash which I find highly amusing. We were in an Indian restaurant one time and I ordered a lamb rogan josh and he said I didn’t know the Indians ate goulash! This is the simplest recipe and of course you can change it to your taste, but the key is slow cooking. If you have a slow cooker then this dish is ideal. You can also spice the dish up too which I often do adding hot paprika. Firstly season the flour with salt, pepper and some paprika then mix the beef in the flour. Heat some oil in a large pan and then brown the beef off in the pan. Remove to a plate then deglaze the pan with some red wine and pour off and keep for later. Add some oil to the pan and fry the garlic and onion until golden. Pour the onions and garlic into a large pot and add the can of tomatoes, the meat the reserved liquid from deglazing. Add the seasoning, peppers, bay leaves, tomato purée and water or stock. Season with salt and pepper. Bring to a boil then put a lid on and simmer for 4 hours. Stir occasionally so it doesn’t stick. About half an hour before serving remove the lid and check for thickness as you don’t want this to be a soup. Raise the heat to thicken the source or if need be add a tbsp of cornflour to water and stir in. When it is a bit thicker serve with a dollop of sour cream on top. Your choice of veggies and potato. There are versions of this dish that serve with a pasta but we usually do mashed potato or some semmelknödel (recipe to come). In Germany it is often served with red cabbage.